A strong showing from Cork saw off the challenge of Mayo at Elvery’s MacHale Park. Doireann O'Sullivan of Cork in action against Róisín Flynn of Mayo. NIAMH COTTER, DOIREANN O’Sullivan, Orla Farmer and Rhona Ní Bhucalla hit a goal each as Cork secured their place in the Lidl NFL Division 1 semi-final with victory over Mayo at MacHale Park. A strong showing from Mayo in the first-half included an Emma Needham goal and Sinead Cafferky scored their second after the break, but despite having three players sin-binned Cork powered to the win. Mayo cannot now reach the last four and they are safe from relegation, but the return of Sarah Rowe for the first time following her stint playing Australian Rules is a lift for Peter Leahy’s side. A strong wind was blowing at MacHale Park and after winning the toss, Mayo captain Niamh Kelly elected to play into it for the first-half. Leahy was no doubt happy with his side’s general play in that opening period, but the five wides they kicked in the first 20 minutes meant they didn’t get the reward they deserved. After a tight opening saw Dayna Finn and Niamh Cotter miss goal chances at either end, it was Orla Finn who found the target first with three frees in a row to put Cork in the ascendency. Mayo’s first point didn’t arrive until the 17th minute when Grace Kelly slotted a free following a foul on Rachel Kearns, while a similar infringement by Hannah Looney on Kearns saw Kelly double her tally four minutes later. Cork had looked threatening down the left side of Mayo’s defence and Daire Kiely came close to scoring, but in the 22nd minute Cotter’s shot from the right dipped in over Michelle Treacy to put Cork 1-3 to 0-2 ahead. That lead was stretched to six points when Doireann O’Sullivan and Ciara O’Sullivan pointed, but Mayo finished the half brilliantly. A superb Grace Kelly point from play was followed by her fourth free of the half, and with the half drawing to a close their hopes were lifted. A cynical pull down of Tamara O’Connor saw Eimear Meaney sin-binned and Mayo awarded a penalty. Kearns’s kick was saved well by Martina O’Brien, but Emma Needham was quickest to the loose ball and she forced it over the line. With wind advantage to come Mayo only trailed by 1-6 to 1-5 at half-time, but Cork started the half with 13 players when Daire Kiely was yellow carded for a swinging arm tackle on Finn in the final action of the opening half. And with Ephie Fitzgerald’s side flooding their defence and breaking quickly while they were two players down they built their lead out to four points with three unanswered scores, but a 38th minute goal from Sinead Cafferky put Mayo back in touch. 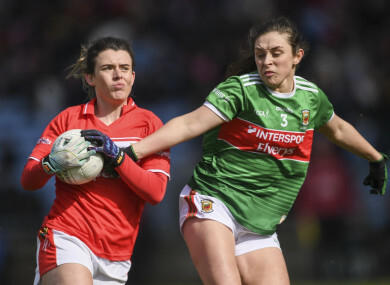 But Cork went straight down the other end of the field and Doireann O’Sullivan’s cracking strike to the net slowed Mayo’s charge, and after Doireann O’Sullivan and Mayo’s Kathryn Sullivan were sin-binned, Orla Finn’s free scoring signed off the win. Cork: M O’Brien (c); E Meaney, H Looney, M Duggan; D Kiely, A Hutchings, E Kiely; M O’Callaghan, N Cotter; O Farmer, E Spillane, C O’Sullivan; E Scally, D O’Sullivan, O Finn. Substitutes: R Ní Bhuachalla for D Kiely (41), M Cahalane for Spillane (55), C O’Shea for E Kiely (60), S O’Leary for Finn (60), L Cleary for Farmer (60). Mayo: M Treacy; R Flynn, N O’Malley, F McManamon; Ciara McManamon, Clodagh McManamon, K Sullivan; S Cafferky, D Finn; T O’Connor, E Needham, N Kelly (c); G Kelly, R Kearns, F Doherty. Substitutes: N Gaughan for F McManamon (h-t), L Cafferky for O’Connor (40), S Rowe for Needham (49), R Durkin for N Kelly (49), L McManamon for Finn (53), A Sheridan for O’Malley (53), R Waldron for Kearns (57). Email “Cotter, O'Sullivan, Farmer and Ní Bhucalla all on target as Cork book semi-final spot”. Feedback on “Cotter, O'Sullivan, Farmer and Ní Bhucalla all on target as Cork book semi-final spot”.